Originally published on Hoodline, October 2015. 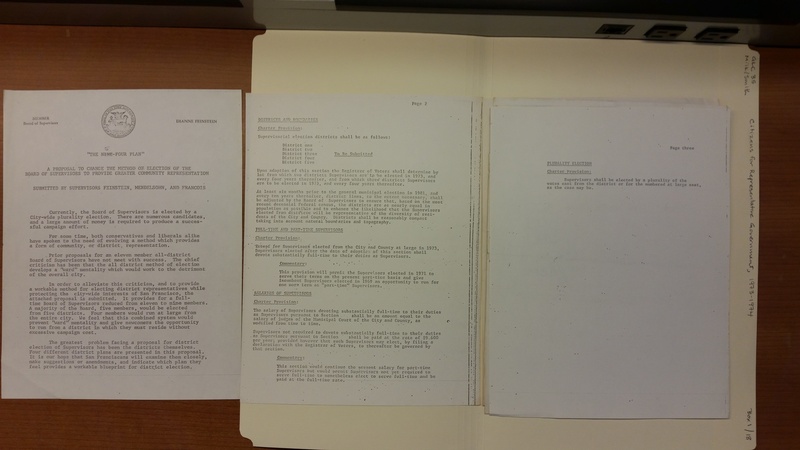 Nearly 40 years ago, a range of activists and community groups got a proposition passed to replace the citywide elections system with districts. The point was to give more power to the city’s various neighborhoods and the diverse mix of people who lived in them. The legislation and organizing in this era got new leaders like Harvey Milk elected, and defined the city’s leftward shift. 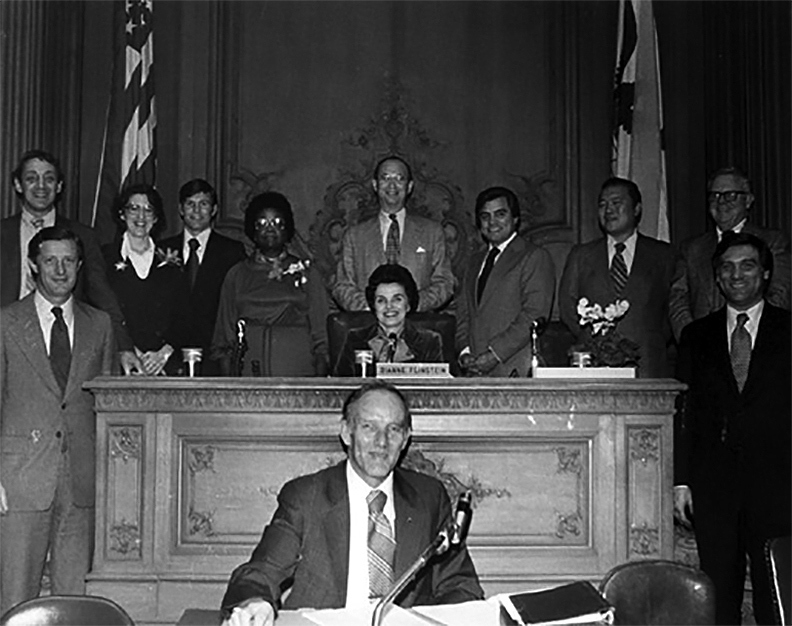 The 1977 Board of Supervisors, the first elected by district, with Harvey Milk, Dan White, Gordon Lau, Willie B. Kennedy, and others. Since the consolidation of the City and County of San Francisco in 1856, the city’s local legislative body has been elected at-large for most of its history. At-large means that the seats designated for the board of Supervisors are not limited by geographic districts. Any eligible San Franciscan could run for any seat on the board, and anyone in the city could vote for the candidates. This system naturally gave more power to whoever was most capable of influencing elections citywide—typically, larger, wealthier institutions and interests. Some of the decisions made by the city’s leaders in the first part of the last century, during this more centralized era, helped trigger the effort to redistribute supervisor power among the neighborhoods. Top-down planning from the federal government, acting through local bodies, tried to usher in a new era of car-based prosperity by building freeways across states—and through cities. The plan was to eventually build high-rise housing and offices around this newfangled transportation network. City planners like Justin Herman hoped that a mix of public and privately financed redevelopment would ultimately be good for the entire city despite the costs. But over the 50s and early 60s, freeway development and urban renewal displaced thousands of people and whole communities without delivering the government's promised benefits. Map illustrating close connnection between freeway and redevelopment plans. Opposition groups formed to stop the Central Freeway—by then across Market and into Hayes Valley—from continuing through the Western Addition neighborhoods, the Panhandle, and the western part of the city to its intended link with the Golden Gate Bridge. The so-called Freeway Revolt’s ultimately successful attempts to stop the plans helped birth a strong neighborhood movement, anchored by groups like the newly-formed Haight-Ashbury Neighborhood Council, and tied in with the civil rights movement. 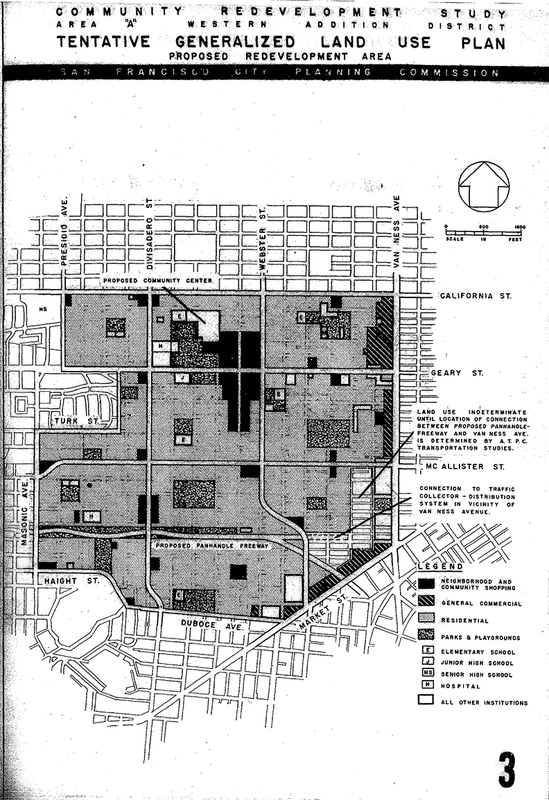 Meanwhile, the Redevelopment Agency had already begun leveling Western Addition “A1” and “A2” zones, and pushing out thousands of mostly black residents, laying waste to a creative heart of black culture in the Western US, the Fillmore district. By the early 70s, these groups—from neighborhood associations to anti-Vietnam war activists to ethnic communities to the growing gay community—decided that they all wanted to drastically change the policies coming out of City Hall. Leaders from these groups began meeting together to figure out what they could achieve, and started calling themselves Citizens for Representative Government (CRG). The group counted several now-famous names among its core couple-dozen members, including future supervisors Milk and Nancy Walker (who later became the president of the Board), influential environmentalist lawyer Sue Hestor, and housing activists Calvin Welch and Rene Cazenave. What brought everyone together was the "defense of space," Welch told us – it was something that every group could identify with, despite many other differences. While the idea of district-level elections had been bubbling up for years, it hadn’t happened in the 1950s and 1960s because of the large amount of political power needed to make it reality. By the early 70s, more moderate and conservative groups tried to develop compromises to acknowledge localized interests and the problems with the redevelopment efforts. The interconnection between left-leaning ideas and “space" might not be as clear in the Bay Area today. A decades-long series of progressive victories around social issues like LGBTQ rights and cannabis decriminalization have been concluding culture wars of earlier decades. But back in that era, socially conservative ideas were much more tied with in with the traditional local political class, and more liberal social and cultural ideas were grouped with corresponding economic ones. And land was as ever the crux of contention. By the early 1970s, leading politicians and business interests sought to add millions of square feet of office space in new towers downtown (the Transamerica Pyramid building, finished in 1972, is an example). As with their earlier thinking behind the city freeways and urban renewal, the established city leaders were trying to attract more businesses to the city instead of losing more and more of them to the suburbs. To the activists, this was the sequel to previous schemes to push them out. Instead of eminent domain and bulldozers, they viewed higher real estate prices as the mechanism for the removal of working people. The CRG organizers, believing they had the numbers, went for a complete change to achieve their larger ambitions. And, in the political context of its era, CRG members saw the kind of oppression that capital and political power directed against neighborhood residents, people of color, and the working class as hand-in-hand with the oppression faced by the people of Vietnam—and America's own sons—at the hands of the US military. The members of CRG wanted to create a new foundation for how society could function in San Francisco: a "collective autonomy" of working people building their power and enjoying all the potential of an urban community, and a model for the rest of the country. CRG's radical organizing methods and ideas were of a piece with the times. In the heat of the Vietnam War, according to Welch, they took inspiration from the Maoism of Ho Chi Minh, applied in a local context to bring about a new society. In San Francisco's case, they perceived the "urban peasant," structurally excluded from power, as the key to organize "the many against the few." Of course, CRG's goal in San Francisco took place in a totally different context from the Chinese Communist Revolution or the war in Vietnam. CRG did not seek to organize San Franciscans to overthrow the government through armed resistance—they organized to build electoral power for their vision of a more just urban society. In this way, the process of changing the way power worked in San Francisco would itself build the new coalition necessary to run the city with a community-based vision. As Community Congress staffer and long-time San Francisco activist Diamond Dave Whitaker described it to us, "neighborhood power was the idea." CRG members began challenging everything they could during the June 1974 local election. A report afterwards shows that 23 of 31 issues and candidates CRG endorsed passed or were elected to office. BART, itself funded in part by voters who were hoping to avoid more freeways, became an early victory for CRG. The members campaigned to have the BART board of directors elected by geographic districts rather than at-large, by supporting the passage of a Proposition A on the ballot that June. These victories combined with the overall growth of community politics in San Francisco and change in city demographics and values, and gave CRG the momentum it sought for bigger changes. 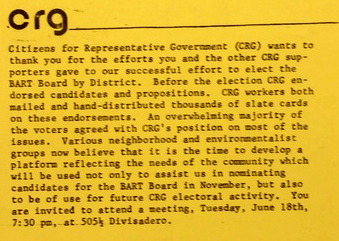 In early 1975, CRG decided to organize a citywide "Community Congress,” where everybody could come together to decide what goals they could all support. 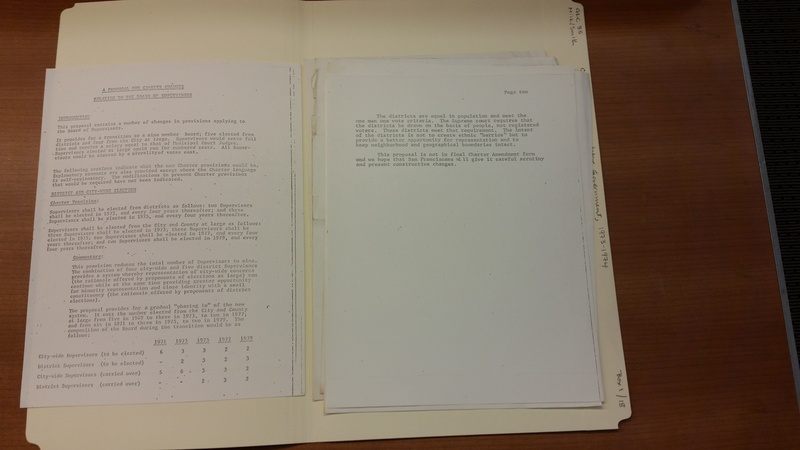 In Welch’s words, these were "practical programs in an urban setting that people would use and like." The Community Congress process began with nine "issue summits," organized around different issues in the City like health, the arts, and criminal justice. The final summit, the Community Congress itself, took place at Lone Mountain College on June 7-8 of 1975. Over 500 people attended and 49 community groups co-signed the 40-page manifesto. Section Five, Part I-F: "The number of community-based drug and alcohol treatment facilities should be increased. Priorities should be switched from control to prevention." and G: "The drug treatment process should be decriminalized;"
Section Two, Part III-4: "The City should develop programs to increase homeownership by low and moderate income people, with an emphasis on cooperative and condominium ownership. In particular, the City should develop cooperative ownership programs for residents of public housing, provided they approve of the programs." and 7: "The City should establish an incentives program to require and enable private developers to provide at least 25% low-rent units in their developments;"
Section One, Part C, a call to form an SF Community Arts Council made of local artists and intended "to expose the corruption and unresponsiveness of official appointed bodies" and "to act as a public advocate for the arts community with the City administration to bring greater artist representation on all arts institutions and all other official bodies;"
Section One, Part A-IV, Item 1: "All Supervisors should be elected by Districts and should reside in the Districts from which they are elected." The 49 groups represented a broad spectrum of ethnic and immigrant groups like Chinese for Affirmative Action and the Organization of Young Latino Activists, neighborhood entities like the Haight-Ashbury Neighborhood Council and the Telegraph Hill Neighborhood Center, community outreach programs like Clayton Street's 409 House, KPOO Community Radio and the National Organization to Reform Marijuana Laws (NORML). 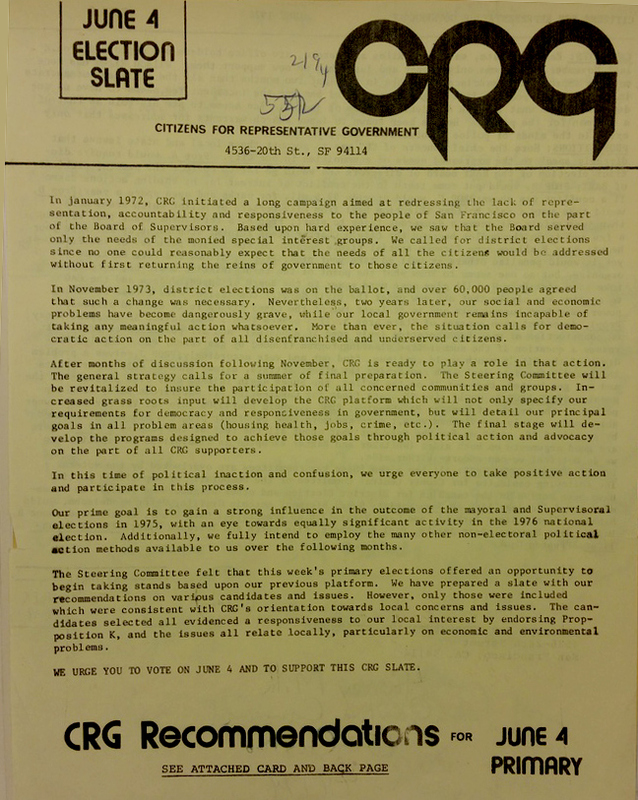 CRG took the manifesto from the Congress and held 18 community meetings over the course of late 1975 and early 1976 where people drew up what they wanted their district boundaries to be. "We asked, 'What neighborhood is north of you? What neighborhood is west of you?'" Welch explained. Each hearing elected two representatives to another city-wide summit where they ratified the district lines. "This way we presented a specific community-drawn plan for the initiative, rather than hand the process over to some city bureaucracy." This redistricting plan became Proposition T, which passed in 1976 with 52.4% of the vote. You can see the voter pamphlet for all November 1976 SF ballot items, including Proposition T, here. The passage of Proposition T opened the doors of City Hall for the first neighborhood-oriented Board of Supervisors in living memory for the City. Coupled with the prior election in 1975 of Mayor George Moscone—the only significant Mayoral candidate to send a staffer to the Community Congress—the November 1977 election marked the start of the modern progressive movement at the heights of San Francisco electoral politics. The new supervisor class included Harvey Milk from the Castro, the first politician in the nation to be elected while openly gay, and Gordon Lau, the first Chinese-American supervisor in the city’s history. And while she didn't run in 1977, CRG member Nancy Walker was later elected President of the Board of Supervisors in 1980. Prob B failed, and within a few years, at least some progressive goals—like rent control and a 40-foot building height limit in residential neighborhoods—had become law. In 1978, the Board of Supervisors decriminalized homosexuality by passing a gay rights ordinance introduced by Supervisor Milk. But on the eve of a key vote to tax and control real estate development that November, recently-resigned supervisor Dan White shot and killed Moscone and Milk at City Hall. And conservative and traditional groups, already gaining momentum from the passage of the anti-property tax Proposition 13 and the backlash against gay rights, convinced voters that district-based elections were too divisive for San Francisco. In 1980, Proposition A passed with 50.58% of the vote and returned the Board of Supervisors to at-large elections. The City wouldn't see district-based elections for Supervisors again until the year 2000, after Proposition G passed in November 1996 with 56.7% of the vote. This is how we vote for Supervisors today. A majority of people in San Francisco are unable to find safe and decent housing at prices they can afford... City government, through its planning and zoning codes, decides what kind of buildings should be built and where... despite all this power, the City routinely allows private developers to tear down low-cost and family housing and replace it with hotels, parking garages, luxury apartments, and other projects designed to serve the needs not of San Francisco 'housing for people,' but 'housing for profit.' If this policy is allowed to continue there soon won't be any room in San Francisco for those of us who aren't necessary to keep the offices and hotels running, and San Francisco will become a City for tourists and corporate executives. Many of the same organizers from CRG, and their political allies and spiritual descendents today, have the same fear. G. William Domhoff, a professor of sociology at UC Santa Cruz, calls the 1978 passage of height limits by the Board "an early milestone for the slow-growth, pro-neighborhood coalition." The social and economic friction of 1970s San Francisco found an outlet in electoral power. District elections enabled a new coalition, backed by neighborhoods and ethnic groups in the city, to emerge at a time when veterans of causes like civil rights, economic justice, and the anti-war movement were looking for local victories. This coalition and its ongoing evolution over the last forty years shepherds much of what we think of as "San Francisco values" including LGBTQ rights, affordable housing schemes, an ecosystem of community organizing, and using protests and direct action to address longstanding problems within the forty-nine square miles we call home.